Last week, bio-entrepreneur icon Craig Venter burst yet again into the limelight. He announced that a team under his direction inserted a chemically synthesized genome into Mycoplasma and succeeded in getting the resulting bacterium to propagate. The work duly appeared in Science and the predictable shouting ensued, from fears that humans are “playing God” to hails of “artificial life”. Several important issues got lost in the din. Let’s leave the obvious potential objections aside – after all, humans started futzing the moment their frontal cortex became prominent and the consequences of this, intended and not, have decisively affected earth and all life on it. Instead, let’s examine the clothes of this emperor closer up. To stick with the metaphor, Venter’s latest is like exactly reproducing a large cloak onto a new piece of fabric identical to that of the original. It’s not like creating a new garment or even cutting and pasting from previous garments to make a quilt, crazy or otherwise. 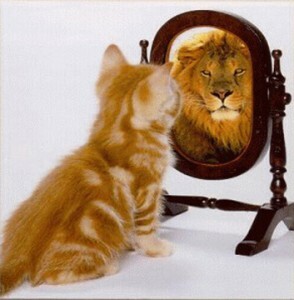 The Venter work is not a discovery, let alone a paradigm shift. 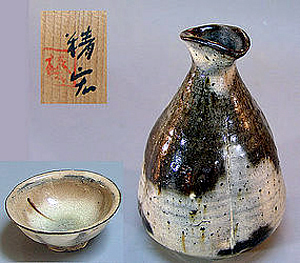 It’s a technological advance and even then not of technique but only of scale. The experiment is merely an extension of a well-known principle that every biology lab uses routinely: namely, that bacterial genomes can be modified almost at will (barring a few indispensable regions) and in such ways as to turn the bacteria into potent mini-factories for specific proteins. The Venter bacterium is actually pedestrian because it carries an exact duplicate of a naturally occurring genome. Its only artificial aspects are the molecular “flags” that its makers included in the synthesis to mark the artificial genome for further tracking – standard operating procedure in all such modifications. Most decidedly, this is not artificial life (though I hasten to add that there is nothing mystical or long-term unknowable about components of living cells and organisms, including the eventual ability to tweak them). To propagate the synthesized chromosome, the Venter team used a bacterium whose endogenous DNA had been removed but was otherwise intact. This means that they used existing natural components to do the real task of propagation – the entire structure and machinery of the host cell. This makes the endeavor even less groundbreaking than injecting genetic material into a mammalian egg or stem cell (as was done to produce Dolly the sheep with far less advanced technology). Lastly, this does not bring us a single step closer to engineering customized functions, from vacuuming up oil spills, excess CO2 or methane to producing chlorophyll or unique drugs. Creating a synthetic cell totally de novo is theoretically doable but far below the event horizon. Altering existing genes and/or creating ones for novel functions is more distant still, because making the coding part is only a small part of the task — if we figure out how to get them to encode it, for starters. Persuading them to express at the right place and time is equally crucial. So is coaxing them to work in eukaryotic cells which, unlike easy-going bacteria, have carefully guarded compartments – the nucleus in particular. In short, the Venter endeavor was expensive, glitzy – and banal. My advice to bioethicists is to save their energy for truly fearsome items, such as recombinant bacteria or viruses that may arise from species pushed together by abrupt dislocations of habitats (and for the inevitable push for a broad research-suffocating patent from this work). I’ve done far more “dangerous” work in my near-constant cloning than this sheep attempting to pass as a wolf… nay, a lion. Note 1: The article is now featured at Huffington Post. Note 2: The article has also been reprinted at io9. A slightly different version of this article appeared on The Tompkins Weekly on May 10, 2010. Not since 2000 has an impending year so intrigued and concerned the general public like 2012. Many people have a vague idea that the world is heading towards some kind of doom because of a calendar created by an ancient and mysterious race. They see every new natural and artificial disaster as one more bit of proof that everything will come to a crashing end – on December 21, 2012 to be exact. What are the real facts behind all the stories, hype, and concern about 2012? Ithaca’s Science Cabaret devoted its last program of the spring to this very year and topic. Titled “2012: Truths and Fictions”, the subject was tackled from two key angles by Ann Martin, a Ph.D astronomy candidate at Cornell and Wendy Bacon, an anthropologist at the University of Pennsylvania. 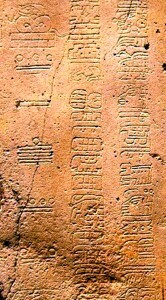 Bacon began with a very brief background on the Maya, the Mesoamerican culture which supposedly started all this fuss. 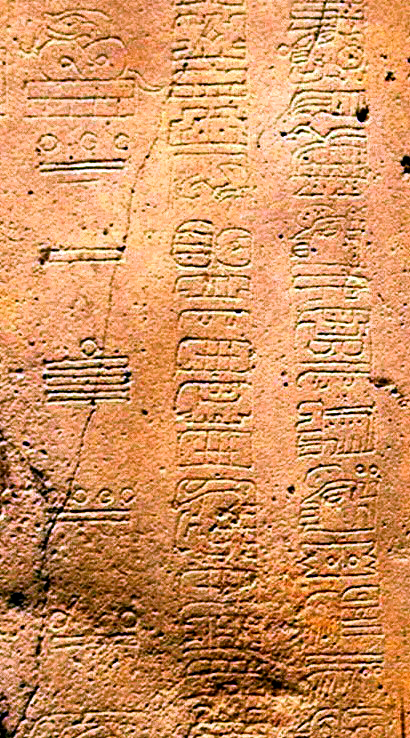 Settled primarily in what is now southern Mexico and the bordering nations of Belize and Honduras, the Maya society (the letter n is added to the end of their name only when speaking about their language) existed from roughly 1500 BCE to 1500 CE when the Spanish conquistadors began settling their region. The Maya did not die out, however: Today between 4 and 9 million descendants of this once great society still live in the area, speaking twelve diverse languages and nestled among the rainforests and the remnants of the magnificent temples built by their ancestors. Martin then took the stage to explain that a Cornell Web site titled “Ask an Astronomer” which started in 1997 and currently has over 800 answers to commonly asked questions about the heavens, began showing a noticeable increase in questions pertaining to 2012. Martin examined some of the recent 2012 documentaries from The History Channel and the recent film with the year as its title. She noted that for the cable programs, sensationalism was prevalent. “Our days are numbered! Prepare for doomsday!” were some of the themes from the programs on The History Channel. As for what exactly is supposed to happen in December of 2012, Martin explained that we have been given three choices: A New Age style time of renewal, the actual end of the worlds, and a major astronomical event. Bacon took the microphone from Martin to describe the Long Count calendar of the Maya which started our society’s focus on 2012. The Long Count began on August 11, 3114 BCE, a date chosen more out of numerical symmetry than anything else. The calendar’s choice of 2012 as its time to recycle is due to matching the number of days from its ancient origin. When Maya society began to collapse from the top down in our tenth century CE, the Long Count of measuring days went with it. “2012 is based on something that hasn’t been used in a very long time,” stated Bacon. Responding to the question of why our modern society has focused on a calendar system that has not been used by the people who originated it in centuries, Martin suggested that one reason is that 2012 will come about sooner than, say, the calendar of the Maya’s neighbors – the Aztecs – which will not see the end of its current cycle until 2027. The Cornell astronomer then addressed the various celestial fictions that have arisen regarding 2012. As one example, some claim that Earth will align with the center of the Milky Way galaxy on December 21 of two years hence and this will somehow bring about a terrible disaster. Using a simple diagram, Martin showed that our world aligns with the center of our galaxy twice a year as Earth orbits the Sun, and has done so for roughly the last five billion years. Martin dismissed claims that our globe will be destroyed when it plunges into the galactic core, which is over 26,000 light years away. She also explained that Earth and humanity will not be affected by plunging through the plane of the Milky Way or if the planets in our Solar System line up (which they will not do on any day in 2012). She noted further that Earth will not be struck by the mythical planet Nibiru, or be fried by the Sun if Earth’s magnetic field should suddenly reverse itself. 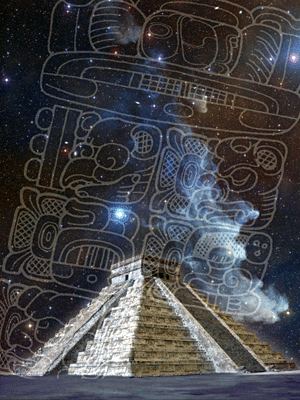 “The public should be excited about the Maya and astronomy,” said Martin. 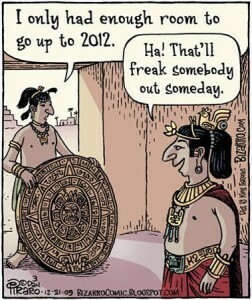 “But instead, people are freaking out about 2012 for false reasons. This is a real shame.” Martin and Bacon both expressed concern about how uncertain and frightened many people (in North America at least) are about the year 2012 due to these unsubstantiated rumors. The scientists foresee a backlash against science from these events, which Martin calls a “loss of cosmophiles” or people who might otherwise love learning about the Cosmos. Images: Chichén Itzá temple/Maya glyph composite, Aaron Logan; glyphs from La Mojarra Stela 1, Veracruz, Mexico — the left column gives a Long Count date of 8.5.16.9.7, or June 23, 156 CE; Maya calendar cartoon, Dan Piraro. 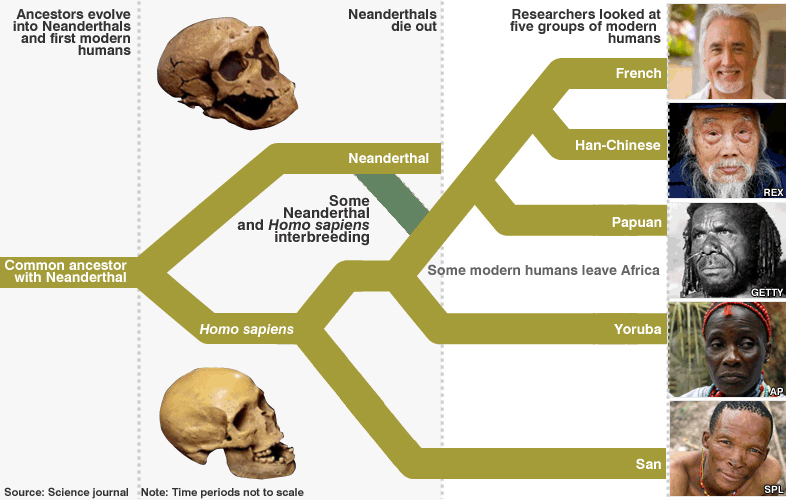 There have been many branches on the hominid tree, but now a lone species walks the earth. We had company once, though, at least in Europe and West Asia – the Neanderthals. Until recently, the scientific consensus was that they were sufficiently different from Homo sapiens that no interbreeding took place. We knew that they controlled fire; constructed tools, shelters and garments; took care of their weak, injured and elderly; and buried their dead with grave goods. But until two decades ago it was widely believed that they had attributes which disadvantaged them to such an extent that competition with modern humans led to their extinction (for example, lack of capacity for complex language, almost exclusive dependence on hunting for sustenance… to say nothing of the Tarzanist view that their doom came about because — horrors! — they allowed women to join the hunt). Finally, the just-published draft sequence of their genome (headed by Svante Pääbo’s team from the Max Planck Institute) showed that up to 4% of the genes of non-Africans may come from them. If confirmed, this means that Neanderthals and Cro-Magnons indeed interbred when the latter first came out of Africa – most likely in the Middle East, before further migration. The two branches of humanity share 99.7% genetic identity. They show differences in genes involved in cognitive development, skeleton structure, energy metabolism, skin physiology. They also differ in regulatory regions and microRNAs. This information will eventually help us answer the question of what makes us uniquely “human” – perhaps even what has made us so adaptable that we now threaten to overwhelm the earth. When I read about the conclusions from the draft sequence analysis, tears sprang to my eyes, just as they do at spaceship and planetary probe launches. It moved me inexpressibly to think that they haven’t vanished but are with us still, a thread in our fabric, a whisper in our song. Note 1: The best fictional depiction of the interaction between Neanderthals and Cro-Magnons is Dance of the Tiger by Björn Kurtén, a distinguished vertebrate paleontologist who was Swedish — as is Pääbo. 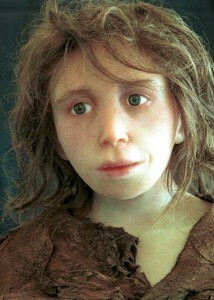 Note 2: The reconstructed image of the Neanderthal child at the top of the article is a collaboration between University of Zurich researchers Marcia Ponce de León and Christoph Zollikofer and sculptor Elisabeth Daynès. 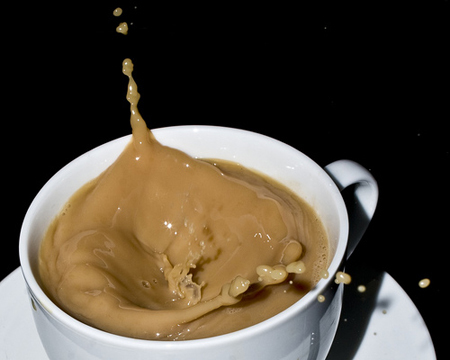 Note 3: The article is now featured at Huffington Post. After my second article about Cameron’s Avatar, a young British media critic who occasionally visited my blog accused me of snobbery. He stated that my points about entertainment like Avatar went past aesthetics and “devolved into” political and moral pronouncements about people who like what he considers lowbrow art (he assumes I share his definition of lowbrow, of which more anon). He further opined that classes of artful brows are just peer pressure. Hence Cameron is as good as Ozu unless you “drip with disdain” for the hoi polloi. In the article that started this discussion I primarily discussed biological drives. I posited that certain types of entertainment arouse the fight-or-flight response and repeated immersion in them can lead to PTSD pathology, including mob-like behavior. The argument that art is ever devoid of politics and (at least implicit) moral judgments is either naïve or disingenuous and my critic doesn’t strike me as the former. I suspect that his cultural background, awash in class distinctions and reverberations of colonialism, may partly explain his viewpoint. Even more fundamentally, however, I think his definition of lowbrow art differs so much from mine that we are really discussing orthogonal concepts. So I’m taking this opportunity to articulate my art classification scheme. To give you the punchline first, my definitions have to do with the artist’s attitude towards her/his medium and audience and with the complexity and layering of the artwork’s content, rather than its accessibility. In my book, lazy shallow art is low, whether it’s in barns or galleries. What makes Avatar low art is not its popularity, but its conceptual crudity and its contempt for its sources and its viewers’ intelligence. A common if usually implicit assumption is that quality and popularity are mutually exclusive. Hence, “lowbrow” is often considered synonymous with mass appeal: bestsellers, platinum albums, blockbuster films. Yet you can have wildly popular art that is light years away from least common denominations. Umberto Eco’s The Name of the Rose comes immediately to mind; so do Alvin Ailey Dance Theater and flamenco; Peter Gabriel and Dire Straits (including their groundbreaking MTV videos); RPG games like Gabriel Knight, Myst and Syberia; and shows about nature or archaeological findings (as accessible “reality TV” as you can get) – or, for that matter, the cordon bleu-quality food you can buy cheaply in corner stores of any French or Italian provincial town. My admittedly idiosyncratic definition comes from a cultural upbringing that makes no rigid high/low distinctions. Hellenes still read Homer and watch Eurypides and Aristophanes for entertainment. To use a parallel from my critic’s culture, Shakespeare and Dickens were not highbrow in their eras. People of all classes watched Elizabethan plays in open-air theaters and Dickens’ serialized novels were the Victorian equivalents of soap operas. Too, a lot of poetry, including that of Nobel-prize winners, has been set to compulsively singable music by Hellene popular composers – and the songs are sung across Hellas independently of social stratum. Along similar (lack of) demarcations, there are no bestsellers or blockbusters in Hellas. Books are printed in small runs and are not warehoused or pulped. As a result, editors take chances on unknown authors but spend nothing on PR, and people aren’t trained to restrict their reading to genres. Nor are films split between hothouse esoterics distributed solely to hoity-toity boutique venues versus “crowd-pleasers” shown in every mall (besides, Hellas doesn’t have malls – it has small shopping courtyards). Finally, we live literally on top of several breathtaking, radically different past cultures, from Minoan to Byzantine. So our sensibilities tend to the syncretic. Most cultures, if not terminally debased, have art woven integrally into the lives of their people. 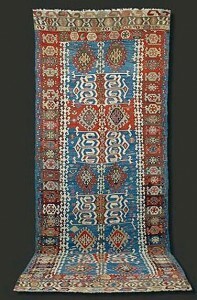 Folk art and craft are often extraordinarily sophisticated both in style and content: clothing, jewelry, utensils, instruments, furniture, dwellings, gardens, cooking, painting, dance, music can all be high art – yet they are part of daily life, not exhibited on museum walls or opulent stagings for the few. This is important not only in itself, but also because such art was/is created disproportionately by women. In such settings, artists/artisans are often political and moral forces to be reckoned with: builders and smiths, storytellers and bards. In some nations they are honored as living monuments that preserve and transmit cultural knowledge. 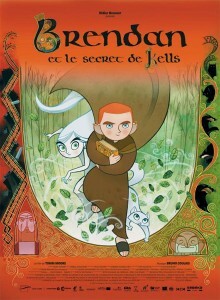 A perfect example of my definition of high art is the Oscar-nominated The Secret of Kells. It uses traditional 2-D techniques and is completely accessible – what my critic would call solidly bourgeois middlebrow. Yet it engages and stimulates many levels of thought and emotion at once. You can focus on enjoying individual aspects: the story teaches real history, since it’s based closely on what we know about the journey of the Kells manuscript from Iona; the conflict is not the usual tussle between monochromatic good and bad guys, but instead highlights the struggle between two versions of good (like Miyazaki’s Mononoke Hime – or Sophocles’ Antigone); the nuanced interactions explore the interplay between Paganism and Christianity, myth and history, imagination and discipline, nature and culture; the style incorporates both Celtic curvilinear forms (in the style of the Book of Kells as well as its Jugendstil descendants) and the tense, jagged shapes used in such graphic novels as The Crow or Sin City. 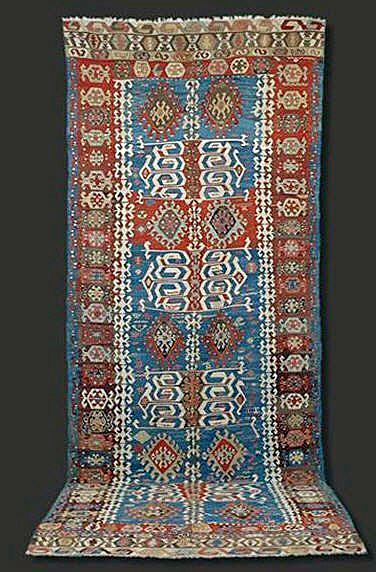 Images and links: kilim rug (Konya, late 19th century); kohiki tokuri sake flask and guinomi sake cup by Kondo Seiko (Niigata, contemporary); poster for Tomm Moore’s The Secret of Kells; Aisling sings magic into Pangur Bán (who has her own lovely story) in The Secret of Kells. Note: If you visit the comments section, you will find that this review drew the attention of the Kells screenwriter Fabrice Ziolkowski and its US distributor Eric Beckman. Additionally, its principal director, Tomm Moore, linked to the HuffPo version of the review from his blog. You are currently browsing the Astrogator's Logs weblog archives for May, 2010.